Patrick reflects on the 3-day workshop in Poznań. Patrick sent these thoughts as he and Ellen were leaving Poland on April 23. A warm welcome from our host club brought joy to the start of our journey in Poznań. Many familiar faces gave a sense of continuity as the workshop began. It was a great success, with many requests from different clubs for future workshops on Lokhup, sword set, push hands and more advanced Tai Chi. Below: Patrick demonstrates a silk coiling exercise, one of the advanced tai chi fundamentals. The class practices with Ellen. 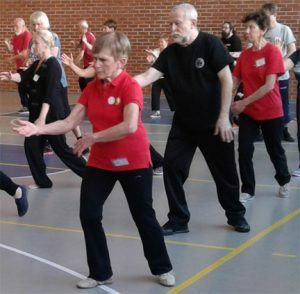 The Workshop was hosted by Poznańskie Stowarzyszenie TaiChi, the Poznań Tai Chi Association.